That’s quite an achievement for a simple building set beside Highway 5A out on the rolling grasslands where the city of Kamloops merges into ranchland. But that was the intention when the Knutsford hall was built almost one hundred years ago. 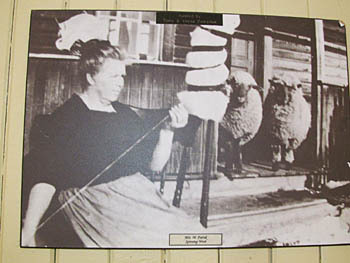 The surrounding area, south of Kamloops, was already settled by many industrious farming and ranching families. Some of their descendants continue to oversee the hall today. In 1914 the first show of the Knutsford Stockgrowers Association was held on a flat above the home of Robert Longridge. In May 1915 first Knutsford hosted the Kamloops District Stockbreeder’s Fair. People decided it was important to have a new building for exhibits. The speed of construction, free from bureaucratic constraints, is impressive. As reported in From Bunchgrass to Barbed Wire, a history of the area, “At a May 5th meeting in 1915 a new building was proposed; Jack Taylor’s offer of $40.00 to superintend its construction was accepted, and with volunteer help, the hall was up by May 24th”“From its beginning the Hall was sponsored by the local agricultural community and designed to support it. The Fair became an annual July 1st event where all aspects of the homesteader’s life were on display for judging: baking, pickling, jam, vegetables, needlework and flowers (both wild and domestic). In one category, ‘Girls Under Sixteen Years: Best Darned Stockings or Socks’, first prize in 1916, went to Therese Furiak. Most important, of course, was judging of stock. From prize Jersey bulls, to handsome Kentucky Thoroughbreds and sturdy Clydesdales, local breeders showed their best animals. Pulling matches tested the horse’s strength. The real excitement came from races and rodeos. Races were run on a half mile long fenced racetrack. The well organized Fair attracted increasing attendance each year. However times changed. Increased competition from Kamloops coupled with growing use of automobiles made travel to Kamloops convenient. The last July 1st Knutsford Fair was held in 1926. In 1928 storekeeper William Finbow bought the building and had it moved from the flat bench by the old fairground to its present location. George Abear, a steam engineer, moved it on large wagons pulled by horses. 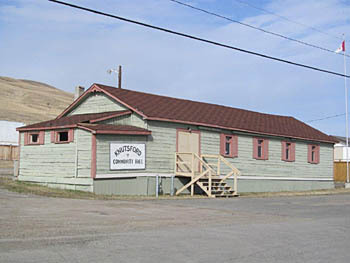 The Hall was still central to the community. All through the 1930s and most of the 1940s it served as a social centre. Its kitchen and small stage made it convenient for a variety of activities. Here the Farmer’s Institute and Beresford Women’s Institute met, as did the Beresford Athletic Club. There were card games, dances, table tennis and badminton games, lectures and bazaars. If it was happening south of Kamloops, it was probably happening at the Knutsford Hall. “Lots of romances started in that hall.” recalls Mona Saemerow. Pausing thoughtfully, she adds, “And some ended there, too!” Mona speaks from personal experience. In September 1945, the then eighteen year old Mona Chester met Mel Saemerow at a dance at the Knutsford Hall. The younger Saemerow brothers told her they had to go threshing the day after the dance. “But I don’t care.” declared George. “My big brother’s home and he’ll look after everything. “ Mel was just back from the war in Europe. He’d signed up to go to Japan and was home on leave between postings. The war in Japan ended before Mel could be sent there so he had time to get to know Mona. They married in 1946. They celebrated their 25th wedding anniversary in the place they first met and danced together, the Knutsford Hall. Its well sprung floor made it a popular place for dances. In those days a ‘nice’ girl definitely did not ‘go outside’ during the dance because some young men went out to drink and things might get a little rough. “Not that there was much rowdyism; if an altercation occurred the proponents soon found themselves confronted by a stalwart young farmer with folded arms who asked, ‘Is there a problem here?’ “Mona remembers. People generally policed themselves. Nevertheless, in 1948, the owners, who, because they were quite religious, didn’t want to be connected with the dances, decided to sell the Hall. "Mona & Mel Saemerow and Mona's mother, Lizzie Chester. Taken at Mona & Mel's 25th anniversary at the Knutsford Hall. Rumour had it that new owner, Eddy Hearn, planned to tear it down. The concerned community rallied round their hall. Johnny Bell offered $500.00 to buy it and ended up buying the land around it as well, for $100.00 more. Mike Farina and Johnny Bell canvassed the farmers for donations to pay the $600.00. Rancher Stewart Morrison contributed $25.00, a large sum of money then, to start things off. Mel and Mona gave $5.00. At the time he was earning $125.00 a month. The rest of the community was equally generous. 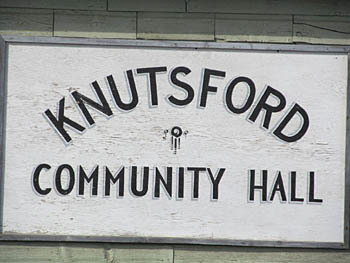 The Knutsford Community Hall Association was formed to look after the building which now belonged to everyone. Today the hall is managed by the Rosehill Farmer’s Institute and it’s as busy as it’s ever been. A ninety-seven year old hall requires a lot of maintenance. The floor is all shored up from underneath. There are no inside walls and no insulation. “On a windy winter day, you might as well be outside. You never see snow on the roof of the Knutsford Hall.”, comments Donna Frolek. Mona Saemerow adds, “For a while the building showed signs of collapsing and the west wall was propped up with a framework of two-by-fours. A work crew headed by George Saemerow remedied that by stretching steel rods across from wall to wall in several places inside the hall. “ In 1948, when Connie Philip first came to Knutsford, the hall had inside chemical toilets. 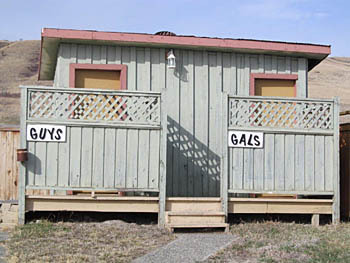 Now there are outdoor pit toilets, even ‘nice’ girls have to go outside. Talk about the courage of the pioneers! “At thirty below, it’s really outdoors,” warns Donna Frolek, “and it can be icy, but that’s part of the heritage.” There are some modern conveniences; ten years ago the hall was hooked in to city water and the kitchen has a pump. In previous years people packed water. There are still surprises; the lever on the pump has to be carefully lifted to prevent a geyser pouring out. Every year on the first Sunday in June a work bee brings volunteers together to repair the hall. The floor is restored, and any necessary painting or re-roofing is done then. “Everybody comes out to help. We do our best to keep the hall together. We want to keep it going and keep it up as best we can.” says Donna. Keeping the hall together means keeping the community together. Not long ago there were many similar country halls. Few are used today. The Knutsford hall is a credit to the people who have maintained a neighbourhood spirit through many changes. It helps that the Knutsford area is still mostly rural. There are no frontage roads or street signs. In fact the hall itself is the spot often used to give directions; ‘It’s two miles south of the hall.’, or ‘Meet you at the hall’. Over three hundred mail boxes and a bulletin board are located near the hall making it truly the hub of the area. “Knutsford is a very active community. Most people know each other. People who move in on a rental basis never want to leave. There’s every walk of life here; doctors, lawyers, ranchers, self-employed, heavy-equipment operators. We’re all part of the community and we all participate.” Donna explains. Keeping the wide-spread community in touch requires effort. Once a year Donna and others conduct a door to door survey to explain the benefits of the hall and sign up new members. This involves travelling from Stump Lake, along the Long Lake road, through Knutsford, Beresford and Rose Hill. As Donna says, “We welcome newcomers, but we don’t force ourselves on them.” Advantages of being a member include receiving the yearly newsletter and attending community events for free. Members also have free use of the hall for private occasions such as wedding receptions, family gatherings and memorial teas. The variety of year-long events means there’s something for everyone. The AGM is in March, there’s a community family pot-luck in May, the work bee in June, a fall fair in September, a children’s Hallowe’en party and a Christmas party. Two 4-H clubs meet there weekly throughout the year. 4-H Speech Night, Demo Night and Achievement Night are held there. Seventy to eighty people attend the Achievement Night pot-luck in November. The Christmas party, usually held the afternoon of Dec. 15th, includes carols, gifts, Santa Claus and Uncle Chris the Clown. From twenty-five to thirty kids attend. 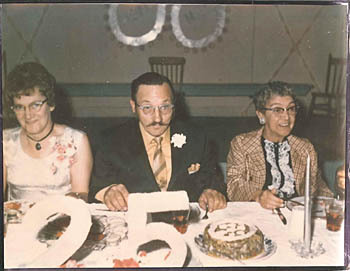 The fall fair, the only fund-raiser for the hall, features a pot-luck dinner, auction and dance, and is always sold out. “The fall fair supports what we do all year. One rancher bought a bale of hay for $200.00 just to support the hall.” says Donna. The Stockmen hold their annual meeting in the hall. In March of 2012, the Kamloops Exhibition Association held its AGM there. Throughout the year there are dance and yoga lessons. Of course, just as there used to be, there are regular dances. “History keeps happening all the time.” Donna observes. The strength of the Knutsford community is that it cherishes its past while adapting to the present.